What is federation with Azure AD? Federation is a collection of domains that have established trust. The level of trust may vary, but typically includes authentication and almost always includes authorization. A typical federation might include a number of organizations that have established trust for shared access to a set of resources. You can federate your on-premises environment with Azure AD and use this federation for authentication and authorization. 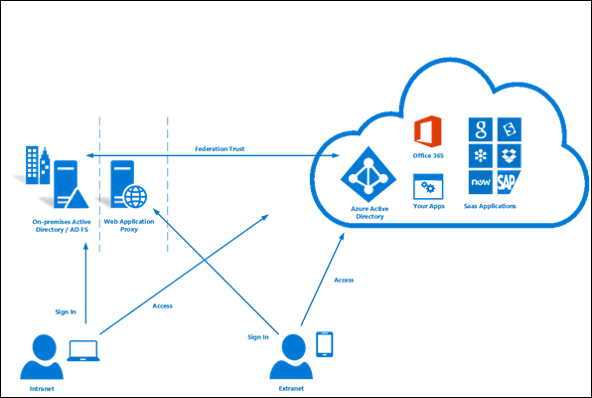 This sign-in method ensures that all user authentication occurs on-premises. This method allows administrators to implement more rigorous levels of access control. Federation with AD FS and PingFederate is available. If you decide to use Federation with Active Directory Federation Services (AD FS), you can optionally set up password hash synchronization as a backup in case your AD FS infrastructure fails. What is password hash synchronization?